The first thing to do in Rennes is take a tour of the historical centre – the route twists and winds around, leading you into the flamboyant Gothic architecture of Saint-Yves Chapel, and then out into streets lined with remarkably well-maintained timber houses, emblazoned with age and colours that you can’t define. Go up to the square that houses the Parlement of Brittany, whose façade boasts so many beautiful windows – a building flanked by elegant private mansions. Head downhill to the Portes Mordelaises, a mediaeval castle entrance gate with two towers – and you will have passed countless restaurants offering crepes and galettes, the local delicacies across Britanny. I tried a creperie with a difference. The black flour galettes served in Creperie Saint Georges have been named after famous people called George, including George Patton, George Clemenceau and Georgio Armani. I plumped for the Georges Remi (Hergé, no less), packed with egg, mushrooms and tomatoes in a parsley sauce. 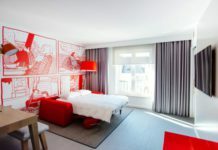 Hôtel des Lices is located in Rennes’ Old Town, close to the opera house. 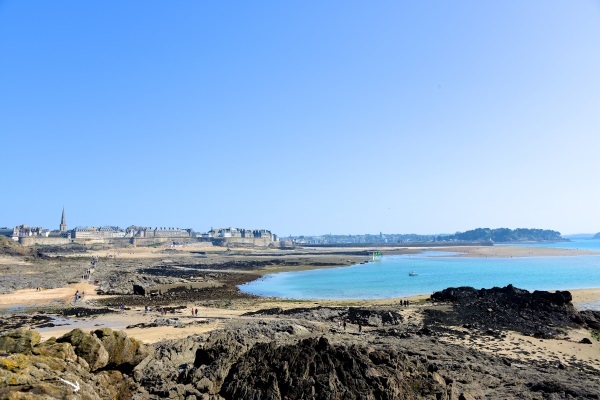 Not far by train from Rennes lies the lovely seaside resort of Saint-Malo, on the English Channel. Its beach meanders around the base of those old thick walls, and you can get lost in it quite easily. I escaped the bustle (in summer it can get very busy) and kicked back in the suburb of Saint-Servan, where you can visit The Solidor Tower, a 14th-century building that holds a collection tracing the history of voyages around Cape Horn. Talk of water is never far away, so, especially if you have kids onboard, visit the Great Aquarium Saint-Malo, one of the largest aquaria in France. A refurbished 17th century manor house facing the sea, The Hotel Le Cunningham is located in Saint-Servan. A short walk down the hill is the excellent Le Spinnaker traditional seafood restaurant, right on the seafront.